What makes customers happy? And what’s a happy customer worth? Eighty-three percent of U.S. consumers say having a positive customer experience with a brand is more important than the product itself, a new study by Harris Poll of 2,000 respondents reveals. Consumers are willing to spend one-third of their disposable income – $100 per month on average – with brands they love based on a great customer experience. That’s around $31 billion up for grabs every month to brands who make their customers happy. Brands work relentlessly on product design and features, but today’s consumer increasingly values how a brand treats them as more important than the product they sell. The Lithium-commissioned study found 43 percent of consumers would actually buy an inferior product from a brand that they had a great experience with, and 73 percent will spend more on a product if it is from a brand they love. But this works both ways, with 71 percent of consumers unlikely to ever use a brand again after only one bad experience. Worse, 44 percent would share their negative experience with friends and family, potentially leading to even more customers fleeing. What does a great experience with a brand mean to you? from Lithium on Vimeo. Rob Tarkoff, President and CEO of Lithium Technologies says. Brands can no longer dictate terms. They must connect with the customer in the channel of their choice, which is increasingly digital. The study reveals 29 percent of consumers prefer to engage with a brand via its website/blog/social channels, compared to 17 percent who prefer in-store engagement, and 16 percent who prefer to connect over email. Harris Poll, on behalf of Lithium, conducted the “Value of a Happy Customer” survey of over 3,000 adults in the United States and the United Kingdom to help us understand what it really takes to make customers happy today. 86% of adults in the U.S. and 74% of adults in the U.K. say they are willing to spend more on products and services from a brand they love. After one bad experience, 71% of adults say they would likely never use that brand again. 55% of adults admit they place more value on a positive experience with a brand than on the product purchased. An Emotional Connection Matters - People tend to have love/hate relationships with brands. Savvy brands today understand that creating an emotional connection with customers is the best way to keep them in the “love” zone. The majority of adults surveyed said that they would be likely to spend more on products and services from a brand that makes them happy (80%), a brand they love (80%), and a brand to which they are loyal (80%). The message is clear: when a brand is able to create an emotional connection with consumers, a stronger sense of loyalty results. A Digital First Mindset - When consumers need to search for something specific, they flock to digital – especially via their mobiles phones – to do it. The same can be said about how consumers engage with brands. A brand’s website, blog, or social channels are typically the first stop when searching for information about products and services. About one-third of adults say they are likely to spend more on products and services from a brand that communicates with them (32%) and shares entertaining and engaging content with them (31%) via social media. No Such Thing as Second Chances - As consumer expectations become increasingly intense, brands have got only one shot to make a good first impression. Otherwise, customers will gladly move on. They no longer have to tolerate a bad brand experience. Over 8 in 10 adults (83%) say they would stop using a brand after one bad experience while nearly 9 out of 10 adults (87%) agree that they would look elsewhere if a brand made them unhappy in any way. COMMENTARY: In-store shopping beats the e-commerce experience across numerous customer service and relationship measures, while online shopping wins for research and pricing, according to the results of a survey of consumers who have used their mobile devices to shop. The survey, conducted by Dimensional Research and sponsored by Wanderful Media, identified several shopping-related activities and asked respondents whether they thought those experiences were better in-store or online. Respondents more often chose the in-store option for measures such as a great customer service (40% vs. 16%), having their questions answered (50% vs. 13%), and establishing a relationship with the merchant (51% vs. 12%). The biggest gap in favorability, though, was for the ease of making a return (64% in-store vs. 12% online). Frustrations with the return experience certainly appear to plague online shoppers, per results from a ShopRunner survey conducted by Harris Interactive. About 7 in 10 online shoppers surveyed feel that returning items purchased online is a complicated process, while an even greater proportion (81%) said they are not likely to make additional purchases from websites that charge shipping on returns. Further details from the Wanderful Media survey suggest that consumers who use mobile devices to shop may favor the customer experience in-store, but they prefer the research and savings possibilities offered online. The online shopping experience was overwhelming favored for the breadth of information available to research purchases (71% vs. 12%), the ease of finding a specific item (59% vs. 14%), and getting the best price (57% vs. 11%), among others. Notably, respondents were far more likely to favor the online path for discovering a previously unknown product (40% vs. 16%). Still, more respondents had made an impulse purchase in the last month in a store than had done so online (74% vs. 65%), suggesting that while they find new products online, they’re more likely to try something new while shopping in a store. In fact, browsing in a store (60%) was the leading driver of impulse purchases among respondents, ahead of email promotions (42%) and window shopping (36%). Interestingly, newspaper circulars (23%) influenced more shoppers than social media channels such as Facebook (22%), Twitter (13%) and Pinterest (13%). Of the shoppers surveyed, the vast majority (91%) said that something they have done online has spurred them to visit a store. Emails held the biggest sway: 60% said they had visited a store after receiving an email about a special price or promotion. Close behind, finding a coupon (59%), seeing an online ad for a sale (56%), searching for a product and finding a store location (55%), and browsing an online circular (52%) also did the trick for a majority. Of various factors that may contribute to a positive experience when shopping in-store, respondents named the absence of shipping charges (64% citing as “very important”), the ease of making a return (60%), the ability to touch, smell, and see the item to be purchased (55%), and getting the item immediately (55%) as the most important. To get the most positive online shopping experience, respondents were most likely to say that the ability to compare prices from a broad range of sources (63% citing as “very important”), the depth of information to research purchases (59%), and the ability to stay home to shop (54%) were very important. Generally speaking, respondents preferred buying books, gifts, and consumer electronics online, and clothes, personal care products, shoes, and furniture in a store. About the Data: The Wanderful Media data is based on an online survey conducted in December 2012 of 1027 consumers. All participants live in the United States and use a mobile device for shopping. 62% of respondents are female and a plurality (40%) are aged 36-50. The ShopRunner survey was conducted online within the United States by Harris Interactive from December 7-11, 2012 among 3,036 adults ages 18 and older. This online survey is not based on a probability sample and, therefore, no estimate of theoretical sampling error can be calculated. Surprisingly, Millennials have a love/hate relationship with technology, according to a study from Zeno Group and research firm CEB Iconoculture. Teens and 20-somethings have a more balanced relationship versus the dependency that generations before them have, says Therese Caruso, managing director, global strategy + insights for Zeno Group. Barby K. Siegel, CEO of Zeno Group said. Kate Muhl, Research Director, CEB Iconoculture Consumer Insights, said. 60% are optimistic about their personal finances, compared to only 40% of the general population. The biggest takeaway for marketers is how influential and different global youth are from past youth generations, Caruso tellsMarketing Daily. It’s really important that marketers understand global youth now, she says. Youth are extremely health aware and guided by a life of balance. They know how to indulge and practice prudence/integrate foods and habits that can live together in a healthy body and mind, she says. Ultimately, their favorite brand is themselves — they use brands to build their own personal brand, she adds. The report also lays out what Zeno Group has branded as the “7 Global Truths” about this generation -- what brands and businesses believe to be the most important consumer constituency, from the influence they will wield in the upcoming election, to their relationship with technology, to how they are redefining the role of leader, and how they are connecting with the world's top companies; and maybe most importantly, how the world’s most successful companies are connecting to them. Youth Wield Powerful Influence. There has never been a generation with more influence both inside and outside the family and this has changed the dynamic of the modern family. Seventy-eight percent of parents with children in this group feel that their kids are more involved in their family’s decisions than they themselves were as children. The New Leadership Paradigm. Global Youth do not view leadership by the traditional, top-down mode. Rather, they prefer a lead-by-example, collaborative model – “leaders bring people together to get things done.” On a scale of 92 values, leadership is ranked extremely low at 65 or high, while equality is ranked number two by the U.S., the U.K., Canada and Australia. Friendship Built on Values vs. Shared Interests. Global Youth build friendships not on proximity or convenience, but on shared values, like morals, ethics and beliefs, and priorities. Thanks to this group’s strong sense of identity, peer pressure is also starting to fade. Technology + The Love/Hate Paradox. Global Youth work to maintain a balanced relationship – not a dependency – on technology. They are keenly aware that technology can support their larger goals, but also know it can work against them. Youth Are Health Aware, Guided by Balance. Global Youth research and educate themselves on all-around health and wellness, and they aren’t interested in “traditional diets.” Out of 92 values, health was ranked number one among Chinese youth – differing greatly from the values of their parents. Happiness Re-Defined: The New WE/Z Happiness Equation. Global Youth view “happiness” as equal-parts balance, success and purpose. Success tops the list as the highest-ranking value among Global Youth in the U.S., Canada, U.K., India and Australia. Purpose is overall a high-ranking value among Global Youth with parents in Canada, Australia, the U.S. and the U.K. ranking purpose significantly lower than youth. A Brand Called “Me”: Youth vs. Brand as Status Symbol. Global Youth are passionate about brands that help to enhance and build upon their own, personal brand. In order to earn this group’s trust and loyalty, brands must understand their mindset and personal goals. Examining the nuances into how Youth think, act and behave is imperative for companies and brands as they look to maintain relevance with today’s most digitally intuitive generation, Caruso says. Gen WE and Gen Z are masters of platform, more self-aware, success-driven, socially responsible and more global-minded than any generation before them. Zeno Group is a global, integrated communications agency, born from PR. The award-winning agency is committed to work that delivers true business value for clients across consumer, corporate, health and technology industries. Zeno is the unprecedented three-time PRWeek US Mid-Size Agency of the Year winner (2011 – 2013), winner of PRWeek Malaysia New Consultancy of the Year (2015), recipient of the SABRE Silver Anvil (2015) and most recently recognized at PR Cannes Lions (2015). Zeno Group is a DJE Holdings Company. SurveyMonkey is the most popular software program for conducting online surveys and analyzing the resulting poll data, according to a recent report from Capterra. The researchers ranked the popularity of survey software solutions based on three criteria: the number of customers (unique companies/organizations that are actively using the software), the number of users (employees who create and manage surveys), and social media presence (Facebook likes, Twitter followers, Google +1s, LinkedIn followers, Klout scores, and number of online reviews). SurveyMonkey has the most customers (2.35 million) of any survey program examined, as well as the largest social media presence; it is tied with QuestionPro for the most number of users (2.5 million). QuestionPro received the second-highest composite popularity score, followed by Qualtrics, SurveyGizmo, and FluidSurveys. Check out the infographic for the full rankings from the report. Buyer personas (sometimes referred to as marketing personas) are fictional, generalized representations of your ideal customers. Personas help us all -- in marketing, sales, product, and services -- internalize the ideal customer we're trying to attract, and relate to our customers as real humans. Having a deep understanding of your buyer persona(s) is critical to driving content creation, product development, sales follow up, and really anything that relates to customer acquisition and retention. "Okay, so personas are really important to my business. But ... how do I actually make one?" Ahh ... the million dollar question. The good news is, they aren't that difficult to create. You just need to ask the right questions to the right people, and present that information in a helpful way so the people in your business can get to know your persona(s) better than the backs of their hands. Now for the even better news: Hubspot put together an interview guide and a free template for creating buyer personas, so it's easy as pie to do your persona research and compile it all into a beautiful, presentable, palatable format. So follow along with this interview guide, and download the persona template so you can start plugging in your research. Before you know it, you'll have complete, well thought-out buyer personas to show off to your entire company! Why Exactly Are Buyer Personas So Important To Your Business? Buyer personas help you understand your customers (and prospective customers) better. This makes it easier for you to tailor your content, messaging, product development, and services to the specific needs, behaviors, and concerns of different groups. In other words, you may know your target buyers are caregivers, but do you know what their specific needs and interests are? What is the typical background of your ideal buyer? In order to get a full understanding of what makes your best customers tick, it's critical to develop detailed personas for your business. The strongest buyer personas are based on market research as well as insights you gather from your actual customer base (through surveys, interviews, etc.). Depending on your business, you could have as few as one or two personas, or as many as 10 or 20. But if you’re new to personas, start small! You can always develop more personas later if needed. Whereas a buyer persona is a representation of your ideal customer, a negative -- or “exclusionary” -- persona is a representation of who you don’t want as a customer. For example, this could include professionals who are too advanced for your product or service, students who are only engaging with your content for research/knowledge, or potential customers who are just too expensive to acquire (because of a low average sale price, their propensity to churn, or their unlikeliness to purchase again from your company). How Can Personas Be Used in Marketing? At the most basic level, developing personas allows you to create content and messaging that appeals to your target audience. It also enables you to target or personalize your marketing for different segments of your audience. For example, instead of sending the same lead nurturing emails to everyone in your database, you can segment by buyer persona and tailor your messaging according to what you know about those different personas. Furthermore, when combined with lifecycle stage (i.e. how far along someone is in your sales cycle), buyer personas also allow you to map out and create highly targeted content. You can learn more about how to do that by downloading our Content Mapping Template. And if you take the time to also create negative personas, you’ll have the added advantage of being able to segment out the “bad apples” from the rest of your contacts, which can help you achieve a lower cost-per-lead and cost-per-customer -- and see higher sales productivity. Now, are you ready to start creating your buyer personas? Buyer personas can be created through research, surveys, and interviews of your target audience. That includes a mix of customers, prospects, and those outside your contacts database who might align with your target audience. Look through your contacts database to uncover trends about how certain leads or customers find and consume your content. When creating forms to use on your website, use form fields that capture important persona information. For example, if all of your personas vary based on company size, ask each lead for information about company size on your forms. Take into consideration your sales team's feedback on the leads they're interacting with most. What generalizations can they make about the different types of customers you serve best? Your existing customer base is the perfect place to start with your interviews, because they've already purchased your product and engaged with your company. At least some of them are likely to exemplify your target persona(s). Reach out to both "good" and "bad" customers. You don't just want to talk to people who love your product and want to spend an hour gushing about you (as good as that feels). Customers who are unhappy with your product will show other patterns that will help you form a solid understanding of your personas. For example, you might find that some of these "bad" customers have bigger teams and thus need a collaboration element to the product. Or you may find that "bad" customers find your product too technical and difficult to use. In both cases, you learn something about your product and what your customers' challenges are. Another benefit to interviewing customers is that you may not need to offer them an incentive like a gift card (a typical incentive for participating in surveys or interviews). Customers usually like being heard, and interviewing them gives them a chance to tell you about their world, their challenges, and what they think of your product. Customers also like to have an impact on the products they use, so you may find that, as you involve them in interviews like this, they become even more loyal to your company. When you reach out to customers, be clear that your goal is to get their feedback and that it's highly valued by your team. Be sure to balance out your interviews with people who have not purchased your product or know much about your company. Your current prospects and leads are a great option here because you already have their contact information. Use the data you do have about them (i.e. anything you've collected through lead generation forms or website analytics) to figure out who might fit into your target personas. You'll probably also need to rely on some referrals to talk to people who may fit into your target personas, particularly if you're heading into new markets or don't have any leads or customers yet. Reach out to your network -- co-workers, existing customers, social media contacts -- to find people you'd like to interview and get introduced to. It may be tough to get a large volume of people this way, but you'll likely get some very high-quality interviews out of it. If you don't know where to start, try searching on LinkedIn for people who may fit into your target personas and see which results have any connections in common with you. Then reach out to your common connections for introductions. For interviewees who are completely removed from your company, there are a few third-party networks you can recruit from. Craigslist allows you to post ads for people interested in any kind of job, and UserTesting.com allows you to run remote user testing (with some follow-up questions). You'll have less control over sessions run through UserTesting.com, but it's a great resource for quick user testing recruiting. 1) Use incentives. While you may not need them in all scenarios (e.g. customers who already want to talk to you), incentives give people a reason to participate in an interview if they don't have a relationship with you. A simple gift card (like an Amazon or Visa credit card) is an easy option. 2) Be clear this isn't a sales call. This is especially important when dealing with non-customers. Be clear that you're doing research and that you just want to learn from them. You are not getting them to commit to a one-hour sales call; you're getting them to commit to telling you about their lives, jobs, and challenges. 3) Make it easy to say yes. Take care of everything for your potential interviewee. Suggest times, but be flexible; allow them to pick a time right off the bat; and send a calendar invitation with a reminder to block off their time. How Many People Do You Need To Interview? Unfortunately the answer is, it depends. Start with at least 3-5 interviews for each persona you're creating. If you already know a lot about your persona, then that may be enough. You may need to do 3-5 interviews in each category of interviewees (customers, prospects, people who don't know your company). The rule of thumb is, when you start accurately predicting what your interviewee is going to say, it's probably time to stop. Through these interviews, you'll naturally start to notice patterns. Once you start expecting and predicting what your interviewee is going to say, that means you've interviewed enough people to find and internalize these patterns. It's time to conduct the interview! After the normal small talk and thank-you's, it's time to jump into your questions. There are several different categories of questions you'll want to ask in order to create a complete persona profile. The following questions are organized into those categories, but feel free to customize this list and remove or add more questions that may be appropriate for your target customers. What is your job role? Your title? How is your job measured? What skills are required to do your job? What knowledge and tools do you use in your job? Who do you report to? Who reports to you? In which industry or industries does your company work? What is the size of your company (revenue, employees)? What does it mean to be successful in your role? How do you learn about new information for your job? What publications or blogs do you read? What associations and social networks do you participate in? Describe your personal demographics (if appropriate, ask their age, whether they're married, if they have children). Describe your educational background. What level of education did you complete, which schools did you attend, and what did you study? Describe your career path. How did you end up where you are today? How do you prefer to interact with vendors (e.g. email, phone, in person)? Do you use the internet to research vendors or products? If yes, how do you search for information? Describe a recent purchase. Why did you consider a purchase, what was the evaluation process, and how did you decide to purchase that product or service? The #1 Tip for a Successful Persona Interview: Ask "Why"
The follow up question to pretty much every question in the above list should be "why?" Through these interviews, you're trying to understand your customers' or potential customers' goals, behaviors, and what drives them. But keep in mind that people are not always great at reflecting on their own behaviors to tell you what drives them at their core. You don't care that they measure the number of visits to their website, for example. What you care about is that they measure that because they need a number they control to show their boss they're doing a good job. Start with a simple question -- one of our favorites is, "What is your biggest challenge?" Then spend a good amount of time diving deeper into that one question to learn more about that person. You learn more by asking "why?" than by asking more superficial questions. Once you've gone through the research process, you'll have a lot of meaty, raw data about your potential and current customers. But what do you do with it? How do you distill all of that so it's easy for everyone to understand all the information you've gathered? The next step is to use your research to identify patterns and commonalities from the answers to your interview questions, develop at least one primary persona, and share that persona with the rest of the company. Use Hubspots free, downloadable persona template to organize the information you've gathered about your persona(s). Then share these slides with the rest of your company so everyone can benefit from the research you've done and develop an in-depth understanding of the person (or people) they're targeting every day at work. If you didn't feel comfortable asking some of these demographic-based questions on the phone or in person, you can also conduct online surveys to gather this information. Some people are more comfortable disclosing things like this through a survey rather than verbal communication. It's also helpful to include some descriptive buzzwords and mannerisms of your persona that you may have picked up on during your conversations to make it easier for people in your sales department to identify certain personas when they're talking to prospects. This is where you'll distill the information you learned from asking "Why" so much during those interviews. What keeps your persona up at night? Who do they want to be? Most importantly, tie that all together by telling people how your company can help them. Include some real quotes from your interviews that exemplify what your personas are concerned about, who they are, and what they want. Then create a list of the objections they might raise so your sales team is prepared to address those during their conversations with prospects. Tell people how to talk about your products/services with your persona. This includes the nitty gritty vernacular you should use, as well as a more general elevator pitch that positions your solution in a way that resonates with your persona. This will help you ensure everyone in your company is speaking the same language when they're having conversations with leads and customers. Finally, make sure you give your persona a name (like Finance Manager Margie, IT Ian, or Landscaper Larry), and include a real-life image of your persona so everyone can truly envision what he or she looks like. Purchase an image from a stock photograph site like Thinkstock, or download one of our royalty-free images. It may seem silly, but it really helps to put a name to a face, so to speak! Most business owners have an ideal customer in mind. However, far too many of them fail to do more than scratch the surface when describing that person. Their customer profiles contain generic, basic information: age range, geographic location, household income, whether they have children or pets, rent or own their homes, etc. In the B2B environment, the customer profile may focus on business information, such as number of years in business, the market served, annual sales and length of time in operation. Taken together, the customer profile provides a marketing starting point. To help you get started developing your customer personas, I found this very helpful infographic titled, "The Science Behind Creating Buyer Personas," which encapsulates much of the above information into a concise format that walks you through the process of creating buyer personas. To know today’s B2B buyers more deeply involves the use of qualitative contextual inquiry. Contextual inquiry has served the fields of social science, qualitative research, and journalism very well. It can serve B2B Marketing and Sales very well also. Buyer persona development is an exercise in formulating customer and buyer strategies. To formulate strategies requires informed knowledge about your customers and buyers. One way to characterize buyer persona development is to call it a strategic modeling initiative. An initiative every level of management should go through to make informed decisions. One piece of advice Zambito can give after being at this for a dozen years – do not skip strategy and jump to tactics. You are going to miss out on plenty about your buyers. Zambito utilizes a strategic modeling tool designed for buyer persona development: the Buyer Persona Canvas™. (Zambito drew inspiration for the canvas from Alex Osterwalder’s, founder of Business Model Generation, wonderful creation of the BUSINESS MODEL CANVAS commonly used in start-ups. NOTE: But should be a key element for developing business models for any company regardless of its stage of development) It is designed to serve as a strategic guide for understanding your buyers more deeply. The model highlights ten (10) areas where we need in-depth knowledge about buyers to make informed strategy decisions. I have actually been involved in the process of creating buyer personas. However, instead of calling them personas we called them lifestyles. Lifestyles is a pseudonym used in marketing that describes how customers spend their time and money. To determine the lifestyles of our customer database, which numbered almost 100,000 customers spread over 17 national geographic areas, we used the services of a professional marketing analytics firm. This was an expensive process which took over three months to complete. I don't recommend this for everyone. The lifestyle analysis that we compiled utilizes demographic data, consumer credit data, census data, and behavioral tendencies about consumers by specific geographic locations. It’s true that you never get a second chance to make a first impression. The proof? Customers are breaking up with retail brands that can’t deliver on their evolving expectations. The tech-savvy generation and their time-pressured parents are rapidly adapting (and perhaps outpacing) retail brands. Customers are demanding a shopping experience that is intuitively seamless, fast, authentic and personalized. So how do you answer the increasing demands of your customers? The customer experience has become the “final frontier” for retailers. It used to be all about the brand. But a lot has changed. Because of increasing customer expectations and falling store sales, retailers are learning that they have to make a big shift. It’s not about the retailer’s brand any longer. It’s all about the customer—and how the brand can create a shopping experience built on this new-found focus. Let’s face it. Most shoppers can find similar or better alternatives online. A large part of why they are coming to the store is for the experience itself. But the pendulum swings both ways. The CMO Council reported that more than half of North American consumers would consider breaking ties with retailers that do not provide offers that are relevant and personalized. So we’ve come to a place in time where retailers are forced to change their ways. The shift of focus must come away from the brand and, instead, highlight the customers’ expectations and needs at an individual level. Brands that succeed in this change will see increased loyalty and profit margins. But those that do not will be faced with a serious decline in sales and brand loyalty. Unless you’ve been hiding under a rock, you probably already know all of this. But the real question is: What do you do about it? How do you create an experience for each and every one of your shoppers that will make them feel that when they enter your brand’s store, they are entering their store? Today most retailers realize the power of personalization and the in-store experience. The problem is that they don’t know how to craft an experience that is unique, and they don’t have the information they need to get started. customer, you will find that personas, your compiled shopper history and an organized real-time message engine are your keys to success. However, before you can cross these items off your to-do list, you need one very important thing—data. personal experience for them. And data will help you to make decisions about what message or offer your shopper should receive in any given moment. To be successful, you need to be sure that data is your foundation for all things moving forward and that your decisions are grounded in actionable insights. Retailers have long used customer profiles as a representation of their marketing segments. personas take these profiles beyond the basic demographic makeup of the customers. A well-developed persona incorporates the basic demographics with financial information (e.g., ability to pay, credit worthiness, net worth), interests and—perhaps most importantly—transactional behavior and categorical spend. True, it does take work (and often money) to create accurate shopper personas. But once this task is done, these can be powerful tools for getting marketers and store employees to understand and obsess about customer needs. marketers have to use personas consistently. They should serve as a reference at every step of the design process so that it’s clear who they are designing the experience for. your personas, they should serve as living, breathing documents that need to be evaluated on a regular basis. If your customer base changes, then so should your personas. Measurement is crucial to ensure that the personas remain an effective guide. Personas are only one element of the personalized shopping experience. Shopper history is another. Capturing a customer’s history with your brand empowers you with hugely valuable information. What have they purchased in the past? What are their preferences? What are they buying with your competitors? Having the answer to these questions can make you a master of the retail universe. But, knowing them is not enough. You have to ensure that they are easy to access. How many databases are the answers to these questions stored in currently? Do your store associates have access to them? Are they fueling the messages that are being served on your ecommerce site? If your answer is no, then you have some work to do. It is one thing to capture this information—but the most important thing you can do is to be sure that it is readily available so you can use it at every step of your customers’ shopping journey. Now that you have created your personas and you can access your shopper history at any stage of your customers’ journey, you have one more very important thing to do. You need a real-time decisioning engine. Sound complicated? Well, in a way, it is. But you already have most of your legwork done with your personas and your shopper history database. Now it’s time to map all of the possible journeys your shoppers may take and think about their experiences. At every step, what offer would be relevant to them in that moment? This exploration takes time and a lot of thought. But in this mapping process, you’re actually creating a database of offers and messages for your customers that will make their shopping experience feel personal and relevant. After all, that’s the goal, right? In essence, this is the secret formula. It’s not possible to make every experience individually and uniquely personal to a single customer. But if you can combine the persona + shopper history + real-time decisioning engine, you will be delivering on an experience that feels custom fit for your shoppers. Your customers don’t have patience for you to figure it out. They just want an intuitive experience that feels as if it was authentically created with them in mind. Shoppers’ expectations of instant gratification aren’t changing. If you can deliver on their expectations, you’ll reap the marketshare of the brands that are not. It’s a lot to tackle if you haven’t already started. Remember, you don’t have to climb the mountain in one attempt. Focus on one aspect of your customer experience and use it as a beta project. Then build upon your customer experience from there. Just as in real-life relationships, your consumers are looking for authentic relationships with the brands and products that they buy. The evolving digital landscape has created competition and endless shopping opportunities. With all of these endless options, consumers want to be inspired. However, through all this evolution, the premise of buying and selling goods hasn’t fundamentally changed. The old adage “Nothing happens until someone decides to purchase something” still applies. The difference is that now shoppers are more equipped to demand an intelligent, transparent, unique and meaningful experience with the brand of their choice. They have more choices than they ever did before when selecting a brand to have a relationship with. Where the brand used to hold the power, now it is the consumer with all the power of choice. To be successful, you need to be strategically prepared to set your brand apart from the competition. To do this, you need to know your customer in a way that feels unconsciously unique and authentic. In the end, this is what will inspire trust for your shoppers. It’s that trust that will kindle a loyal relationship with your brand. Today the customer is in control. They decide if, when and how to interact with their favorite retail brands. With all the channels of interaction available to the consumer, retailers need the ability to develop well-grounded engagement strategies to maximize the customer experience every minute of every day. As a new breed of marketing partner for this customer-empowered world, our approach harnesses the power of rich data, world-leading technologies, engaging creativity and transformative ideas to connect customers to brands and deliver dramatic results. Customers today have many options. We can help you create meaningful customer connections, resulting in increased revenue, more frequent engagement and more efficient marketing spend. Based on a survey of 46,000 consumers, the CX Index measured and ranked 299 large US brands, across 17 industries, on the quality of their customer experience. USAA is ranked number one. Other companies among the top 15 include (in alphabetical order): Ally Bank, Amazon.com, Charles Schwab, Discover, Edward Jones, Etsy, HSN, JetBlue Airways, Lexus, Navy Federal Credit Union, Newegg, PNC, QVC, and Zappos.com. In the Forrester index for 2015, retailers remain the best at providing a great customer experience, but it is interesting to see that parcel shippers and hotels dropped way down the index – last year they were up there at the top with retailers. And there is an important distinction to make with retailers. Digital-only online retailers are much better at providing a great customer experience than those with a store network. Megan Burns, Forrester Research principal analyst serving customer experience professionals said. Megan explained that this year's CX rating used different methodology that now incorporates customer loyalty in determing the overall CX rating. "The biggest change in our new approach is the way we judge CX excellence. To hit a home run, the 299 brands we studied had to do more than make customers happy. They had to design and deliver a CX that actually helps the business by creating and sustaining customer loyalty. Our new rules shook up the standings and pulled a bit of a Billy Beane, tipping conventional CX wisdom on its head. For example: Customer loyalty is undergoing a rapid change from being the way that you manage a points-based program with plastic cards to a strategy that requires engagement with customers and an ability to improve their experience with your brand." Megan said that there is a shakeup on the CX leaderboards for 2015. "For the first seven years of the CX Index, retailers, hotels, and parcel shippers dominated — but not this year. As industries, hotels and shippers dropped to the middle of the pack. Retailers held on to first place, but there’s an asterisk on that particular stat. We broke the retail industry into two groups in 2015 — those with physical stores and those without. Retailers without stores (we call them digital-only retailers) kept the top spot. Those with stores fell multiple places in the industry standings." Megan cautions that a high CX rating may not always be worth it and that there maybe a point of diminishing returns that brands may not want to cross. She says. "In most of the industries, we saw a strong positive link between CX quality, loyalty, and loyalty-driven revenue. But that wasn’t always the case. Our models for one industry showed a very clear and compelling point of diminishing return. Taking CX from poor to okay is more profitable for brands in this space than going from okay to excellent. That doesn’t mean that anyone can afford to ignore CX. Many aren’t even hitting the okay mark right now. But it gives executives something to think about as they refine their company’s overarching CX strategy." The challenges of creating a great customer experience extend from the tactical to the strategic, from remaking processes to encouraging innovation and from building new skills to integrating an array of technologies. Despite the varying maturities and consumer habits that are bound to exist on a regional basis, the criticality of customer centricity has remained consistent. The challenge is for organizations worldwide to create memorable experiences that also make a difference to the bottom line. Further evidence of the ubiquitous focus on customer experience can be found in Figure 7. More than three-quarters (78%) of company respondents are attempting to differentiate through CX, with 28% strongly agreeing with the statement. In comparison, only 5% of companies are not trying to use customer experience as a point of differentiation. It is clear that the coming year will see plenty of activity in this area. 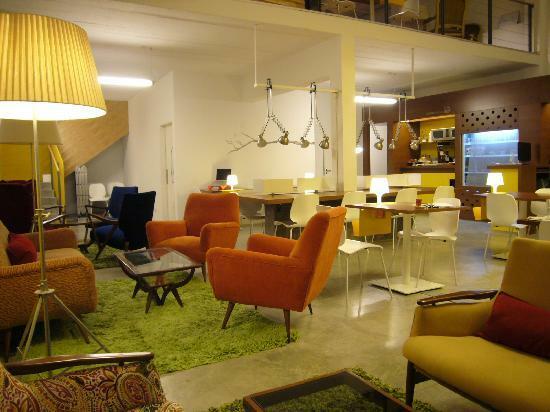 Organizations have spent considerable time getting their respective houses in order. The next step for many is execution; pulling together mobile, content, data and the various other building blocks and deploying them in a harmonious fashion. Creating an excellent customer experience is a complex process, but the respondents’ enthusiasm and dedication to using it as a point of differentiation bodes well. Companies have committed to customer experience for the long term. This is critical, as a commitment to customer experience means a commitment to a structured, longterm view on delighting the customer. Simply put, customer experience isn’t simple. For many organizations, the goal of turning customer experience (CX) into a competitive advantage means recreating themselves. That’s because the customer’s experience is the result of every part of the company working together, or failing to. Decisions made in fi nance and human resources can have just as much impact as those in marketing and product teams. This interconnection is one reason that a cultural shift should underlie any strategic priority around CX. It’s not easy to get hundreds or thousands of employees to realign their thinking, but it’s essential if the shift to the customer is genuine. Here are some fundamental building blocks necessary to create a CX culture at your company. Unified Team or Company - Perhaps the most powerful element of culture is the potential for unity. When teams or entire companies are unified around a vision, it energizes them and can counteract some of the normal tensions between departments. Common Customer Experience Perspective - In a business environment where there are far more options for how to spend time and money than the ability to follow through, nothing is more useful than focus. When the organization begins to share a common perspective that the customer experience drives growth, it focuses everything from budgets to daily priorities. Customer-Centric Business Organization - Declaring that CX will be a defining organizational characteristic is a choice that means prioritizing customer-centric qualities over other business goals. As this permeates the organization, this new direction can galvanize innovation. In a business, creativity is often at its best (or most useful) when it’s given context and boundaries. The move to build a great CX opens the door for creativity in every team and at every level. How important is CX? Thousands of companies tell us that it’s the number one way they hope to differentiate themselves over the next fi ve years. The product and service commoditization in many sectors means that while offerings must be competitive, they’re less likely to be a competitive advantage. Even starker is the end of the price war; only 5% of respondents see themselves as being able to set themselves apart with their pricing strategies. Strategy is the easy part. As challenging as it is to discover and define corporate direction, strategy is a malleable set of ideas that depends on the buy-in of a relatively small group of people. It’s within the context of culture that strategy becomes practice. Its success or failure depends on whether the wider audience of employees, partners and other stakeholders understand and support it. A cross-team approach – building a truly customer-centric enterprise means working together. It’s not simply a marketing initiative. Product, fi nance, customer service, sales, marketing and management have to work together. The good news is that a cross-team approach that transcends the silos of the past is a powerful and more effi cient way to work.2 The bad news is that it’s very hard work to change internal structures. Realignment through incentives – at the heart of any effective transition is using fi nancial and other incentives to reset priorities. For example, this might mean a simple redefi nition of how bonuses are calculated to include a customer satisfaction component. But, it could also be using a more sophisticated set of goals around cross-team cooperation and customer evaluation. Supporting experimentation and understanding failure – a great customer experience combines existing best practices with new discoveries and innovations. One of the hardest challenges for some organizations to overcome is to make experimentation a part of the culture. Risk and failure-averse companies actually risk failure when they don’t embrace a vigorous campaign of experiments in the name of superior customer experience. Personalization depends on technology, but it is human insight that moves it beyond the algorithms relating products and people. Great personalization can be fundamental to relevance, while bad personalization feels intrusive and unnecessary. Value is an expression of cost and benefit. The benefits to a customer are a mix of what they get and how they perceive it, which is why marketing has to be both the voice of the customer to the enterprise, and the voice of the enterprise to the customer. Making customer experience fun or fulfilling is a challenge and only 7% cite it as their path to differentiation (Figure 10). It’s powerful for those that can connect brand with experience in ways that delight customers3 but most companies should first focus on getting the basics just right. Customers want to know what to expect. Consistency in experience should go far enough to make them feel safe and to fulfil on expectations set in other media. At the same time, every medium has its unique traits. A mobile site should be simple and useful above all, which should be balanced with overall brand consistency. Safety and speed are the first steps of customer experience. Digital customers who are concerned for their data will never buy, nor will they return if they find the experience slow or awkward. Similarly, while mobile can be a differentiator today, marketers looking at the future recognize that it won’t be one for long. The growth in visitors and buyers is forcing every digital marketing team to be mobile-ready. In the U.S. retail market, the word luxury doesn’t have the same connotation that it once did. Or perhaps it’s just that the consumers who shop for luxury goods aren’t who they used to be. Either way you look at it, defining luxury today is no easy task—and neither is identifying how people view the term. For many consumers, luxury is a way to signal that they’ve “made it,” but the ways they choose to showcase or express their status can be as varied as the consumers themselves. For example, some convey it subtly through the scarcity and heritage of the products they purchase. Others take a more forthright approach by purchasing eye-catching products they want to showcase for everyone to admire and covet. Regardless of how consumers choose to bring luxury into their lives, the U.S. has the deepest pockets when it comes to luxury retail spending. In fact, management consulting firm Bain and Co. estimates that Americans spent $73.3 billion on luxury goods last year—more than consumers in Japan, Italy, France and China combined. Despite the breadth of the U.S. luxury goods market, however, retailers have plenty of untapped potential to explore. In fact, a closer look at the luxury goods arena shows that the households that want to buy luxury goods outnumber those that already do by 8%. In order to engage with luxury-buying and aspirational buyers, retailers need key insight into the specific differences among these consumers. While no two consumers are exactly alike, Nielsen has identified five distinct perspectives around the meaning and value of the term “luxury,” and has categorized them into specific consumer segments. Three of them value luxury and make luxury retail purchases. The other two value and aspire to buy luxury items, but are less likely to actually make the purchases. The aspirational consumer market is vital for luxury brands looking to achieve volume and growth. Both younger and older aspirational consumers place value on luxury products, but they haven’t traditionally been luxury consumers themselves. Lower-priced offerings and partnerships with mass merchandisers give these consumers access to the brand and build loyalty. A luxury purchase should feel like an indulgence and a reward for aspirational consumers. Aspirationals under the age of 55 tend to live in college towns like College Station, Texas, and Lafayette, Ind., and they often shop at retailers like Burlington Coat Factory, Express and Old Navy. Aspirationals over 55 tend to shop at retailers Stein Mart and Chico’s, and live in Florida locales like Homosassa Springs, Punta Gorda and Sebring. COMMENTARY: When it comes to luxury products, 73 percent of luxury consumers consider quality to be the most important attribute, according to a study by the Luxury Institute and Epsilon. “The new face of luxury: Breaking down the myths and stereotypes of the luxury shopper” aims to better understand the luxury shopper. The research study was conducted by Epsilon in partnership with the Luxury Institute. The report focuses on defining the different tiers of luxury consumers, focusing on those who are true luxe customers and those who are aspiring to that level. By understanding their consumers, luxury brands will be able to adjust their marketing tactics based on the individual’s level of consumption. Milton Pedraza, CEO of the Luxury Institute, New York said. Interacting with consumers in a relevant and personal manner is key for brands looking to make a connection, especially since 50 percent of luxury brands lose their top clients every year. Also, since 47 percent of consumers say it is the customer service that defines a luxury brand, understanding and catering to the top customers is vital. Aspirational shoppers are individual who want to own luxury items, but cannot afford to on a regular basis. They typically shop at outlet stores or on discount Web sites and purchase low-ticket designer brand items. Moments of wealth shoppers may save for a specific piece from a specific luxury brand, but they are not a regular consumer of the brand. Dressed for the part shoppers purchase luxury items to present themselves as someone living a luxurious lifestyle, but do not have the finances to be true luxe shoppers. True luxe shoppers do not have any financial concerns when purchasing and buy from luxury brands on a frequent basis. Understanding where individuals lay in the scheme of luxury shopping and where they may jump to is important for brands. With a degree or a job change, consumers can move up a level of luxury shopping. Between the ages of 25 and 44. Their net worth is more than $500,000. Annual incomes between $125,000 and $250,000. Online shopping is less than 25 percent of sales for luxury brands, since consumers are still shopping in-person, leaving an opportunity for brands to offer more traditional white glove experiences. However, this does not mean that luxe consumers are not actively online. Here are some stats that prove this point. 98% regularly use the Internet and more than 50 percent research products before purchasing. 75% compare prices on their mobile devices. 75% of these consumers are on social media, but less than 25 percent engage with brands on Facebook. The digital nature of these consumers allows brands to have an online presence and attract consumers online, but offer customer service in-person. The report suggests that brands organize and analyze housefile information to best understand their consumer’s habits and purchasing history. Luxury brands are delving into more bespoke options and marketing, according to Wealth-X’s president at Luxury Retail Summit: Holiday Focus 2014. Mr. Friedman spoke about the necessity among brands to understand their consumer, who they are, what they do and who their friends and family are in order to gain a full understanding of these individuals in order to effectively market. Luxury brands can learn from Wealth-X’s research on the ultra-high-net-worth individuals to create specific marketing strategy for the ultra-affluent (see story). Some brands are adopting data trackers to attempt to understand in-store sales and trends. For instance, Italian lingerie maker La Perla has teamed with a software platform to create a platform that will be implemented for all La Perla boutiques and fashion stores where its products are sold. La Perla worked with MicroStrategy Mobile to analyze sales and other company data points through key performance indicators. This new technology will allow La Perla to be aware of information in all its stores and make necessary alterations to tactics without too much delay (see story). Taking these opportunities to learn about and understand clients is vital for brands looking to engage and maintain a relationship with individuals. After tracking trends among the wealthy for over 35 years, we know how and where to uncover the ultra-affluent. It’s not only where they live that’s important; it’s their possessions, positions and proclivities that matter in determining an accurate definition of what it is to be a member of the top 1%. Most B2B marketing/sales databases lack key information about prospects and customers, according to a recent report from NetProspex. The report was based on an analysis of 223 million records in the databases of B2B companies. The researchers examined which commonly required fields were "missing" from each record (the report makes the assumption that each of these data points is necessary, which may not actually be the case for all companies). Some 84% of the records analyzed were missing revenue information and 82% were missing employee information about the lead's/customer's company, the analysis found. Website domain (72% did not include). The researchers also gave B2B companies overall "health ratings" in various marketing/sales data categories, including email deliverability, record completeness, phone connectivity, and record duplication. B2B companies in general are doing a good job of dealing with duplicate leads/customers, with 90% of databases containing fewer than 10% duplicates, the analysis found. In contrast, more than half (54%) of the records analyzed did not include a phone number, and many others were inaccurate, making "phone connectability" poor overall. Email Deliverability: Based on the findings of the b2b research study, overall email deliverability rates continue to introduce unnecessary risk into email marketing programs. While there is an overall trend of improvement over the past three years, the average company database deliverability was still less than optimal, with a Health Scale Rating of 3.2. Record Completeness: Lead scoring, lead routing, effective content personalization and web customization are all highly dependent on having actionable information about each prospect or customer. Most marketers don't have the time to wait for progressive profiling to kick in, and can't afford to compete against fake form data. Phone Connectability: When it comes to improving the demand generation funnel, the ability to reach buyers by phone is fundamental to closing the loop between sales and marketing — and keeping that relationship as healthy as possible. Yet, all too often, marketing databases are filled with inaccurate telephone numbers — or no numbers at all. Record Duplication: Internally, record duplication hinders effective account-based marketing strategies, marketing attribution and ROI analysis. It also increases storage and maintenance costs while decreasing the effectiveness of lead scoring. About the research: The report was based on an analysis of 223 million records in the databases of B2B companies. 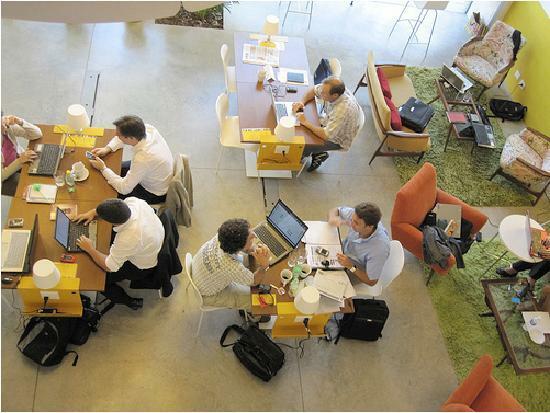 More people are working remotely than ever before, which is bad news for coffee shops. Once the province of college students and stoned poets, suddenly they’re teeming with everyone from copywriters to pushy corporate types willing to raise fisticuffs over a free electrical outlet. What’s a cafe owner to do? So how does Urban Station make money? It rents desks. We don’t know the exact pricetag but they tell us it’s “less than a promotional breakfast in any Palermo bar.” The conventional wisdom is that charging for anything in a cafe is a bad idea; that people won’t even pay for wireless, let alone a seat.Urban Station’s trick is to throw in a raft of perks: Wi-Fi channels; food and drink included in the cost of the hour; printers; fax machines; scanners; lockers; and even a couple of bikes you can bang around on when you need a break. There’s a real and growing market for this sort of thing. Seventeen million to 26 million people work remotely at least some of the time depending on how you calculate it. And the figure will only swell as companies look to cut costs and workers increasingly eschew desktop computers for mobile technology. Freelancers and part-timers already spend hundreds of dollars a month -- or more -- on co-work spaces. 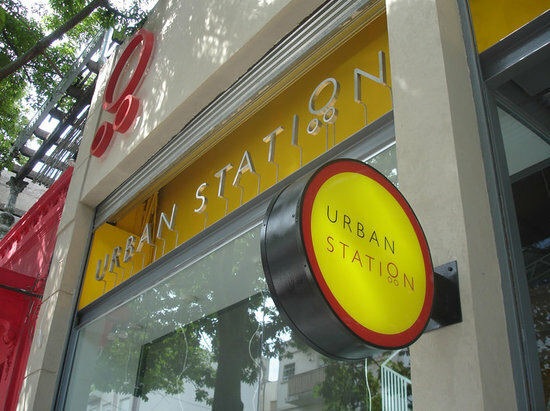 Urban Station’s the same idea, but with free food. One quibble: The design, while cheery, feels a tad unpolished. (A green futon with purple earplug tables? This is not a Deee-Lite music video, people.) Corporations are always prettying their offices, then holding them up as company billboards; if Urban Station is going to be the workplace of the future, it might wanna do the same. 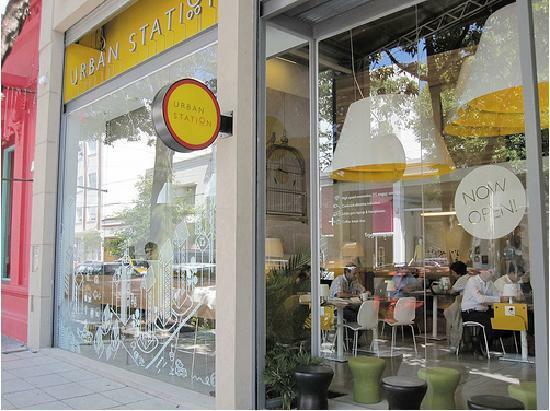 COMMENTARY: I love the Urban Station office cafe concept very much. To my knowledge, I don't believe we have anything similar in the U.S. I don't believe they are going to get a lot of college students, who spend very little at cafe's offering free WIFI, and very often bring their own food, and tend to hog the tables for hours on end. Many cafe's in the U.S. have gone the other way, and stopped offering WIFI in order to discourage these practices. Urban Station's concept provides a lot of value-added features, offering an environment designed specifically for the mobile office worker. Instead of tables, they are more like workstations. Patrons pay for the food and beverage and for actual spent working at their "workstation". This is a very cool idea, but Urban Station does did not divulge whether they are actually making any money with that concept. Just the same, I sent off for some information.